In the homily of the closing Mass of the Council on December 7, 1965, Paul VI showed himself to be a partisan of a radical Humanism and declared himself a worshiper of man. In a conversation with his friend Jean Guitton, Paul VI referred to these startling declarations as the "trumpets of the Apocalypse" that he blew. 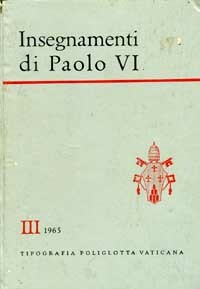 Right, the cover of the Insegnamenti di Paolo VI, volume III, 1965 March 15, 1995. 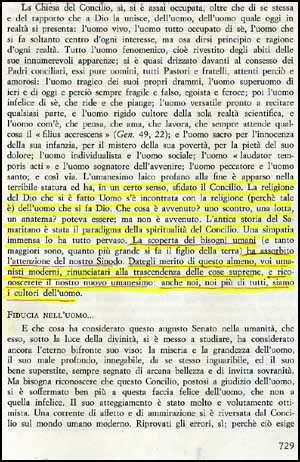 Below right, an excerpt from his homily, below left, our translation from Italian of the part highlighted in yellow. Secular and profane Humanism ended by revealing its terrible stature, defying, in a certain sense, the Council. The religion of the God who willed to become man encountered the religion (for that is what it is) of the man who wants to become God. What happened? A combat, a fight, an anathema? This could have happened but did not. The old story of the good Samaritan was the paradigm for the Council's spirituality. Indeed, an immense love for men profoundly permeated it. Human needs, examined and considered in detail ... have absorbed the attention of our Synod. You modern humanists [in the original Latin read by Paul VI the words cultores humanitatis, or worshipers of humanity, were used in place of modern humanists] who renounce transcendental truths ought to pay tribute to the Council for at least this and acknowledge our new Humanism. For we also, and we more than anyone, are worshipers of man." Paul VI: As a Specialist in Humanity I Approve the U.N.